Along with our complete list of individual hosting services, we also offer powerful pre-built Web-based applications. These systems are already constructed which means there are no development costs to build them. Since they are web-based, they can be used on any platform (Windows, Mac, Linux, Unix, etc) from anywhere in the world, and there are no software installations necessary! And, they can be easily adapted to each business or organization on a new or current website. We offer specialized systems for many uses, such as e-commerce, business collaboration, and many more miscellaneous uses that can be added to any existing or new websites. If you don't see what you are looking for, be sure to ask us! We may be able to come up with a personalized solution just for you! The Web Store system has a clean and professional look throughout, designed to easily get your products online in a store-like format. Our Web Store has full functionality including a shopping cart system, user registration, newsletters, and many other features to promote your business. Click here to read more! The Web-based Groupware System is a suite of integrated applications tied together to allow easy and reliable communication among employees. It can handle company email, schedules, contacts, meetings, notes, todo lists, and personal bookmarks, all in one web-based interface. Click here to read more! The Email List Manager is a powerful interface for managing all types of email mailing lists. From bulk email broadcast lists to specific interest groups, our list manager keeps track of lists and has automated features to make it easy. It also archives old messages for easy retrieval later. Click here to read more! The Advanced Bug/Problem Tracking System is designed for tracking bugs and problems in products, but is easily adaptable to just about any scenario for problem tracking, from IT support queues to computer system problems. It can increase productivity and accountability of employees by providing a documented workflow. Click here to read more! The Advanced Project Manager is a complete system for organizing projects within any organization. It seamlessly organizes projects among the people working on it, and incorporates many features such as forums, email, chat, and more for members to communicate with one another. It also includes timesheets and a calendar system to track each individual's work. Click here to read more! The Content Management system is built on one of the most popular systems, Joomla. Every customer gets a full and independent installation of Joomla, along with our customized security features that we install on top of the base Joomla software for ultimate Joomla hosting security. 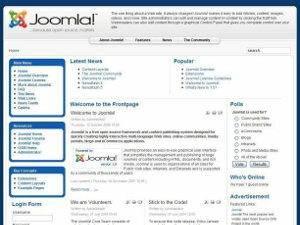 Take advantage of a large array of Joomla templates available as well as the community support to back it, to quickly and efficiently design full featured websites with your browser. We don't just give you a blank control panel for you to install the software, we install the Joomla software for your site, so that it's ready to use. Click here to read more! 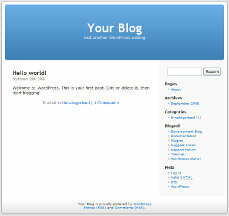 The Personal Blog system is built on the most popular blogging system, WordPress. Every customer gets a full and independent installation of WordPress, along with our customized security features that we install on top of the base WordPress software for ultimate WordPress hosting security. We don't just give you a blank control panel for you to install the software, we install the WordPress software for your site, so that it's ready to use. Click here to read more! The Forum and Bulletin Board system will let you quickly and easily set up your own electronic messaging board. This system is complete with features, including support for multiple categories, automatic email notifications and message purging, message searching, total user management, access permissions, and much, much more! Click here to read more! The Online Survey System is a great tool to build surveys and collect results from them, easily and efficiently. Create an instant online survey, poll, rating, feedback form; many types of questions are fully supported. Results can be viewed within the system directly, or exported to the program of your choice for further analysis. Click here for more information! The Online Course Management System is designed to create an online course or learning environment. This system is packed full of features for both the instructors and students, with full access restrictions, automatic enrolling, web-based layout and customization, and Paypal integration for pre-paid course scenarios. Click here for more information! The Automatic FAQ (Frequently Asked Questions) System is a complex tracking system that builds a FAQ using input from multiple users. The FAQ is moderated by a single person or group of users. All of the pain and time-consuming work of maintaining and organizing a simple or complex FAQ are done automatically with this robust sytem that is packed with features. Click here to read more!